The Swannanoa Gap Tunnel, a 1,832-foot-long railway tunnel through Swannanoa Mountain near Asheville, was completed on 11 Mar. 1879. After chipping away the final barrier, workers tunneling from opposite sides of the mountain were elated to discover that the two tunnels lined up perfectly. James H. Wilson, chief engineer of the Western North Carolina Railroad, immediately sent a telegram to Governor Zebulon B. Vance stating that "daylight entered Buncombe County this morning through the Swannanoa Tunnel." The first train finally steamed through the tunnel into Asheville on 3 Oct. 1880. 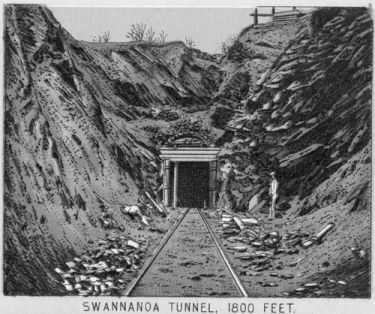 Plans for the Swannanoa Gap Tunnel were drawn up after the Civil War in an effort to make Asheville a railway hub for North Carolina's western counties. Of the large number of workers employed, many were convicts serving misdemeanor sentences, and approximately 120 perished during construction. The tunnel, which cost about $120,000 to build, was cut with the help of nitroglycerine, marking an early use of the explosive in engineering. Lou Harshaw, Trains, Trestles, and Tunnels: Railroads of the Southern Appalachians (1977). Mitzi Schaden Tessier, Asheville: A Pictorial History (1982). NC Marker P-46, located at Old US 70 at Ridgecrest in Buncombe County. Image courtesy of State Archives of North Carolina. Available from http://www.ncmarkers.com/Markers.aspx?MarkerId=P-46 (accessed July 25, 2012).